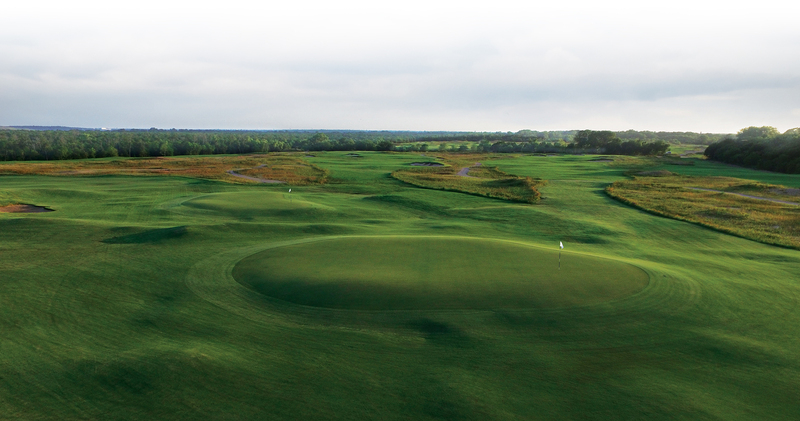 The course absolutely exemplifies C&C design despite not being exactly the ideal piece of land. 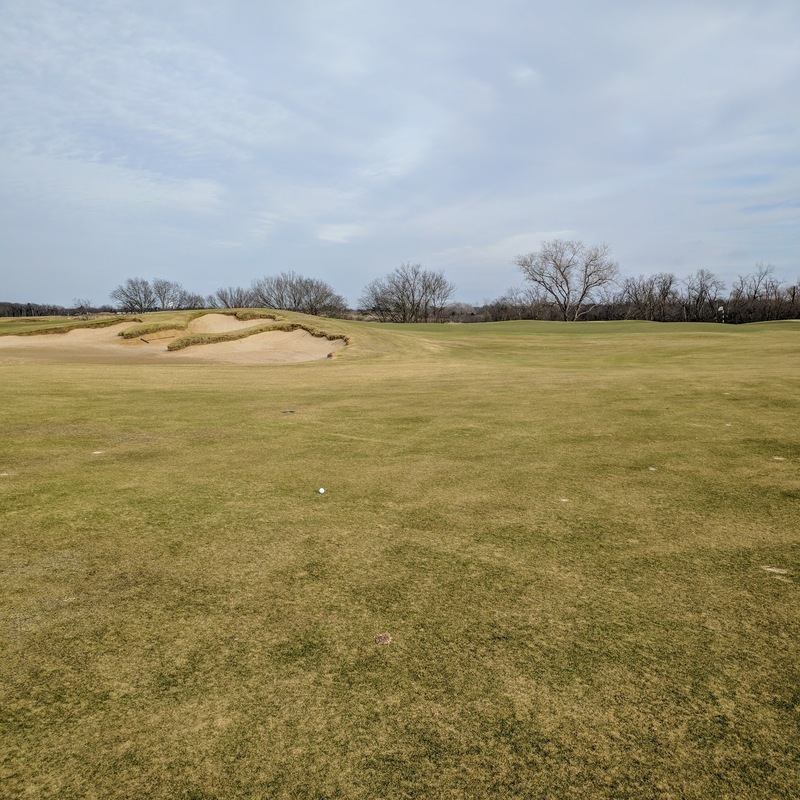 Check the google earth screenshot below, and you’ll a rectangularish, dried out in the wintertime patch of Texas that has very little to no elevation, save a valley that cuts right through the middle of the land which is crossed a few times during the round, and forces carries on two of the par 3s. 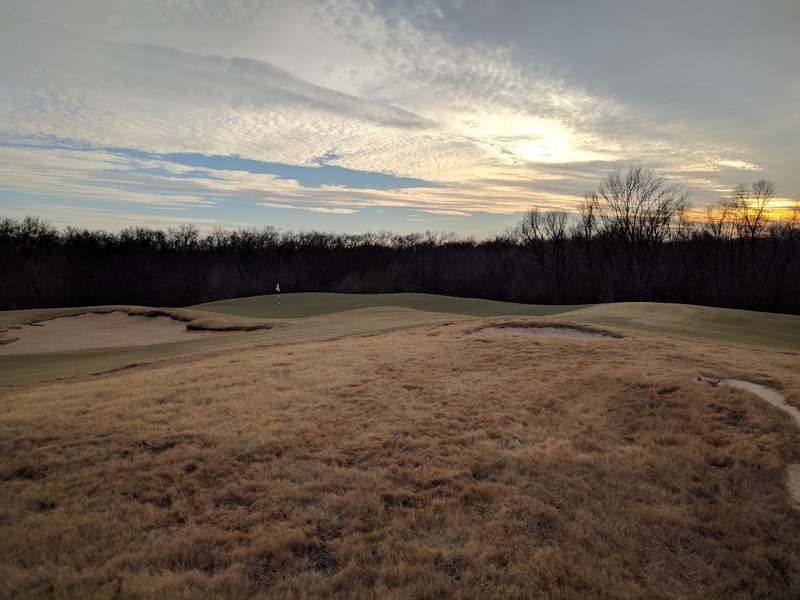 Besides that, the property is surrounded by dense trees which kind of serves as an out of bounds on the outside holes, but otherwise, there isn’t much in terms of distinction, and yet, the course still turns out awesome. The course is slated to take over the AT&T Byron Nelson Championship in 2018, and as Pat noted out there, it’ll be tough for anyone who’s not a member to win that tournament. The subtle breaks of the greens, and knowing where to miss it is key key key. 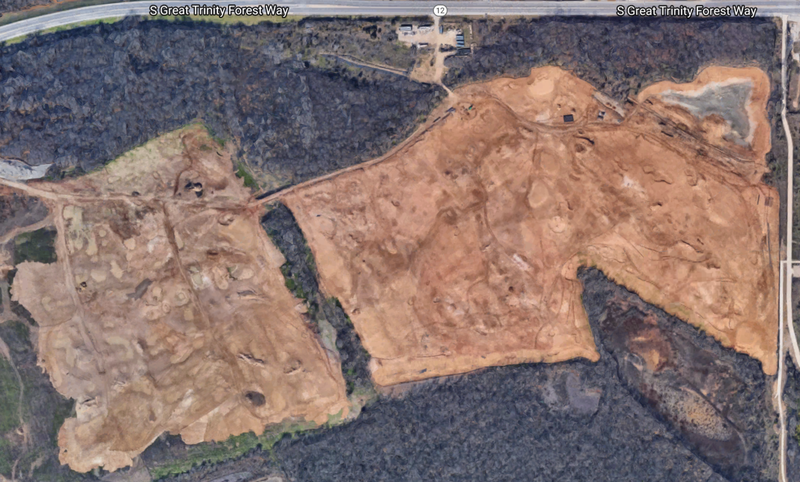 Google earth view of the property. Range and 9 hole course to the north, not pictured. There was a little quirkiness out there, which is to be expected for this type of linksiness style. But again, quirkiness is in the eye of the be-golfer. I think my tolerance for quirkiness is somewhat low, whereas GOTM contributor Mike’s is right level for this course. For example, I felt that the giant ridge on the 8th green was a little much. Where if you get stuck on one side, it could be impossible to get the ball close to a hole. Mike thought the ridge was perfectly fine, but that’s might be because he made par there, whereas I 3 putted. Another example is the 11th green, another long par three, where it was tough to hold the green with a chip after missing it to the left. When you’re not able to hold a green with a chip, that might be a little too quirky. Keep in mind this was with the slow, winter greens. I can’t imagine what it’ll be like when they get the greens cooking in the spring and fall. 8th hole, par 3 hover the valley. Pin was back, so needed to make sure to go long and stay left. Talking after, we did have a couple other critiques of the course, but very few compared to the positives. Because of the long, rectangular nature of the land, most of the holes run the same direction. 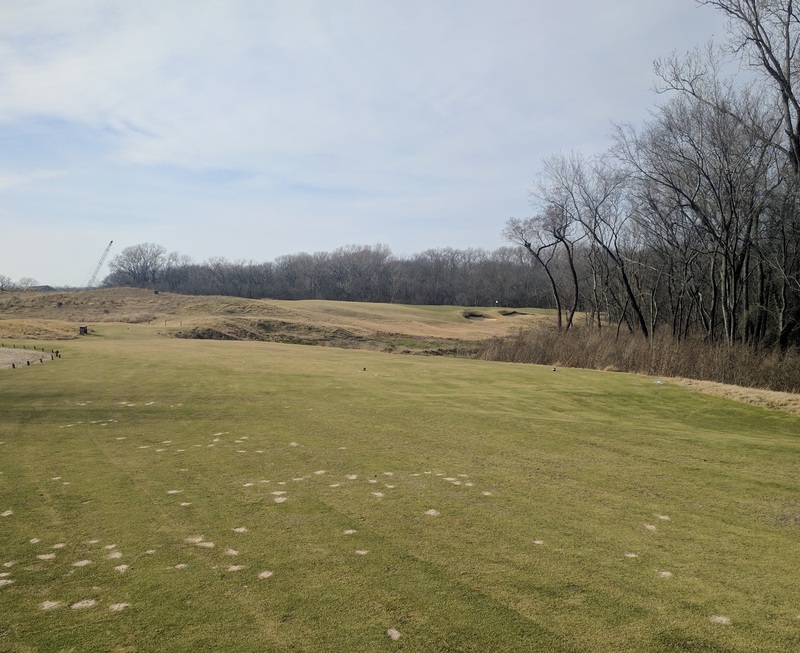 The warm weather, hard fairways, somewhat gusting winds blew straight down two different par 5s which where I was able to hit two 400 yard drives and have two 60 degree wedges in on second shots. Both led to two birdies of mixed feelings. Then again, not much you can do in this case because the par 5s pretty much have to be run length-wise on the property. Finally, it seems like most of the par 4s were somewhere in the 420-460 range. The course passed the uniqueness test where we were able to remember each hole after the round, but we had a little trouble with some of the par 4s that were all flat, semi dog legged. But it’s really tough to create distinct par 4s on flat ground by bunkering and green complex alone. Back to the positives, because there are way more of those than negatives. Now this could just be because it’s winter time, but the fescue / waste areas that usually are a penalty shot if you hit into were basically nulled out be the short length of the grass. This meant that driving the ball was freaking awesome because you could just swing as hard as you could on every shot. A little offline in the waste areas? No issue finding the ball or getting a club on it. In fact, I don’t think there was ever a hole, besides the drivable par 4, where you needed to lay back of. Texas golf! Double green from above, also taken from the course’s website. As for notable features, there’s the double green for the 2nd and 10th holes, which is in fact not quirky, but looks entirely reasonable. Not a good angle for the pin on the left. A really cool par 5 (that I don’t have pics of) is the 5th hole. It’s situated on the farthest point of the property, all the way to the right on that Google Earth image above, and runs along the short end of the land rectangle. Avoiding the main bunker plopped in the middle of the fairway off the tee, you’re left with a shot that exemplifies the continuous nature of risk reward. It’s a blind layup with the hole moving downhill, and there’s tons of room to the left that’s a simpler layup but will leave you with an shot with the green pitching away from you. Or you can creep your layup shot closer and closer to the right side, but that leads it closer and closer to you having a 100 yard bunker shot. The forest of trees was also long of the green, so playing your approach short is the way to go, but that left us all with long lag putts. We were all pleased to get away with pars. I loved the final stretch of three holes too. 16, a standard par 5 gives you a chance for birdie if you feel like taking it close to the edge of the tree hazard on the left. 17, a short par 3 with a green that has a hump in the middle is also a birdie chance, assuming you can hit a wedge to the right section. Finally, a long, 500 yard par 4 to finish. I think the key when playing this course is to make sure you get the ball back in play on the correct side of the hole if you hit a bad shot. This is actually the type of mentality that I try to use on every course, but it applies here more I’d say. Other places my big numbers came from a water hazard, or the freak two shot out of bounds drive. I can’t remember the last time I made this many doubles without losing a ball. Overall it was an awesome course, we had great weather with it sneaking into the 80s in late December, and it was a blast. Obviously the course is private, but if you have a way to get on, absolutely do it. 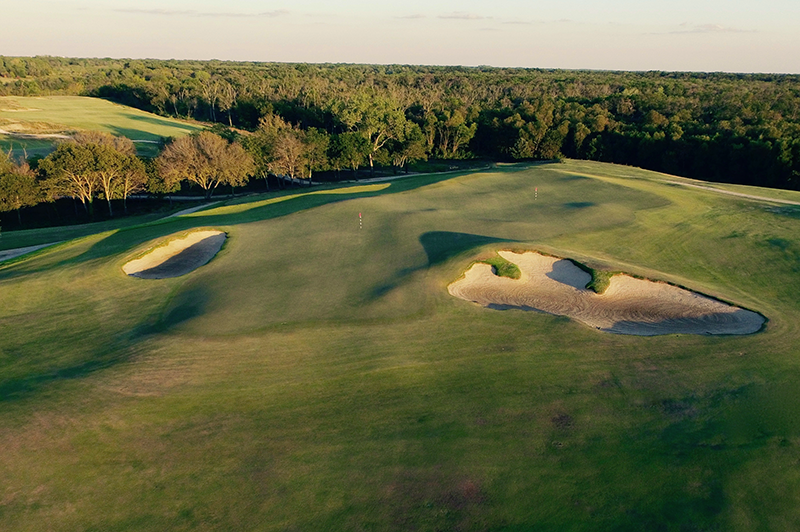 Because as you know, in order to be cool in today’s golf world, you need to play as many Coore Crenshaw courses as you can. Looks like another great Coore and Crenshaw course. The Plantation course at Kapalua and Bandon Trails are a couple of the most fun courses I’ve ever played. Great summary. I felt like I played the course. SMU guys are pretty lucky.